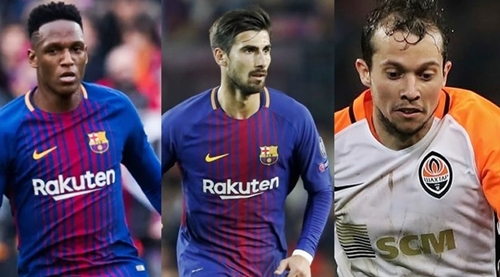 Premier Leaugue side, Everton, have completed the signings of Yerry Mina and Andre Gomes from Barcelona. Everton have reached an agreement with Barcelona to sign Colombia defender Yerry Mina for 30.25m euros (£27.19m), while agreeing to sign Mina's team-mate, Andre Gomes on loan. The Toffees have also signed Brazilian winger, Bernard on a permanent deal. Barcelona said they reserve the right to buy Mina back, while Gomes will cost Everton a £2m loan fee. "Everton is historically the fourth most successful club in England," said Bernard. 25-year-old Bernard, was out of contract after leaving Ukrainian club, Shakhtar Donetsk in June. Everton have yet to announce Mina and Gomes but Barcelona said on their website that they had reached agreements for both to move to Goodison Park. ðŸ‡§ðŸ‡· | Bernard signs a four-year contract with the Blues! Mina's arrival will mean Everton have spent more than £60m in the past two weeks following the initial £35m arrival of Brazilian winger Richarlison from Watford, a deal that could rise to £50m.